Congolese people wait for Congo's Independent National Electoral Commission (CENI) press conference to announce the results of the presidential election outside a bar in Kinshasa, Democratic Republic of Congo, Jan. 9, 2019. 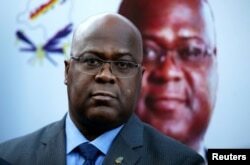 After several days of intense speculation on the outcome of the DRC’s presidential elections, the country’s election board, CENI, proclaimed Felix Tshisekedi the winner. The result could lead to the country’s first democratic transfer of power since independence from Belgium in 1960. The announcement came as riot police were deployed in the capital, Kinshasa, amid fears of a disputed result in the Dec. 30 vote marked by accusations of vote fraud. The U.S. Embassy in the Democratic Republic of Congo had warned Americans to leave the country, as Congolese officials prepared to announce the results. The message urged Americans to avoid large crowds and demonstrations, monitor local media for updates, and remain alert for dangerous situations. The election in the DRC had been more than two years in the making. 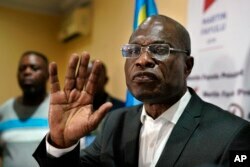 Postponed twice by the ruling coalition, the Common Front for the Congo, problems persisted even after a date was set. Nevertheless, the elections finally went ahead in late December. There were a number of candidates vying to lead the country. The three key contenders were Emmanuel Ramazani Shadary, from the governing Common Front for the Congo, who had close ties to the Kabila government. Martin Fayulu was chosen by the major opposition candidates after a meeting in Geneva in early November 2018. Opposition candidate Martin Fayulu speaks to the press at his headquarters in Kinshasa, Congo, Jan. 10, 2019. Fayulu, who came second in the presidential poll behind Felix Tshisekedi, called the results fraudulent. Lastly there was Tshisekedi, leader of one of the Congo’s oldest opposition parties, the Union for Democracy and Social Progress. Fayulu and ruling party candidate Shadary can contest the results before the country’s constitutional court, which has 10 days to hear and rule on any challenges. President Joseph Kabila is scheduled to leave office this month after 18 years in power — and two years after the official end of his mandate. He backed Shadary, his former interior minister, in the election. The DRC suffers from widespread corruption, continuing conflict, endemic disease, and some of the world’s highest levels of sexual violence and malnutrition. It is also rich in minerals, including those crucial to the world’s smartphones and electric cars.